The Soroti Women’s Cooperative Limited (SOWCOL) has been hard at work during 2016. Using funds from TDT, they were able to train a further 15 communities in using a Village Saving and Loan Association (VSLA). These 15 communities are now saving effectively, and are able to provide short-term loans to help people. The VSLA method has proved to be very beneficial, particularly in helping individuals start of their own businesses and improving their quality of life. Below are some stories of people who have benefitted…..
Josephine Amalo of the Itimoi VSLA Grou p she is 22years, her husband James is a young man of 25 years and they have 2 children. They joined the VSLA group in 2012 and bought 6 cows out of their savings. Space for keeping their animals became their problem so they sold some of the cows to top up their savings during 2013 and started a foundation for their house. This is now at the height of the ‘ring beam’. 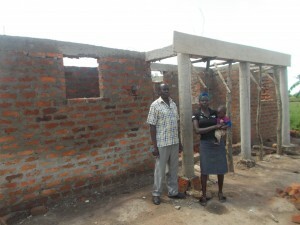 They continue saving in their group, and hope to finish the new, larger house in the near future. Ronald Kabagambe Ronald is 28 years. He has a wife and a child. Ronald was a Chapati (a type of flat-bread) maker and he joined VSLA in 2013. By saving into the VSLA and gaining interest, as well as having a small loan, he was able to buy a motorbike. He he put to uses as a ‘boda boda’ (motorbike-taxi). 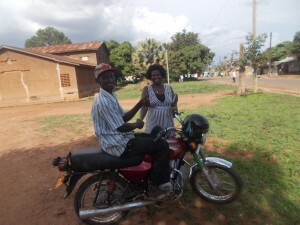 By continuing to save, he has now bought his 2nd motorcycle to increase his ‘boda boda’ business. Ronald is still saving and says he wants to buy a plot of land where he hopes to construct a house for his family.